Click on the text size you need. REFRESH the page if needed. I receive them and add them to this webpage myself. These boat lifts are solidly built and reliable. I have had mine in the water since 2004 and have had no issues. I grease the wheels and chain in the spring and the fall. I also remove the bunks in the fall. The lift still looks new. When I decided to look for a boat lift I researched as many as I could find. In the end I found this to be the best built one with excellent quality. I needed one that I could leave in the water during the winter and this also met that requirement. I raise the lift to the maximum height in the fall and in the spring it is ready to go (our lake level drops about 5 feet in the fall and then is back up in the spring). I also found them the most knowledgeable on lifts. When I bought the lift I did not include the lift motor. After three years I changed boats and the new boat was heavier. After a year with the heavier boat I decided to add the lift motor. The boat lift was already designed for the motor and I was able to install it myself with very good instructions from Bo (this was my decision to install it myself). Any time I have had questions they are always willing to spend time to answer them and help. I definitely recommend this boat lift and would not hesitate to buy one again. (personal stuff)....As for the boat-lift by Viking, well, what can I say? It has performed like a Viking: hardy, reliable and ultimately problem-free and absolutely no rust! Kinda like me, a well-oiled machine! As you know, I have put out many, many recommendations for Viking Boat-Lifts over the years and, will continue to do so! Take care and great to hear from you! Thank you we are fine! Our Viking lift continues to work as promised by your company. We have done some greasing and oiling but other than that we just use it. Excellent piece of equipment. We have had our Viking boat lift since 2007 - BEST INVESTMENT I HAVE MADE AT THE COTTAGE !!! My Dock has shifted and has been repaired 3 times - My Viking Lift has not moved an Inch !!! I recommend this lift to anyone I know, I am very pleased with the functionality, reliability and service provided by Bo and company. The lift is beautiful, it is sleek and clean, I still get compliments on the lake about the lift !!! General Manager, Lintex Computer Group Inc.
...thought we would share our first evening with our boat on the lift with you! All went well. It was worth the wait!! I can't believe that its been 5 years since the boat lift has been installed. It has worked flawlessly since you set it up. Its a neighborhood land mark..."the floating sail boat", because the lift hides behind the boat, and from most angles, the observer only sees, the boat lifted into the air, but cannot see the lift. Its a great work of art and engineering. I couldn't be happier with your product. It's been a long time since I sent you an email! My family and I really enjoyed the dock and lift this past season! The Viking Lift System WORKS GREAT! I did adjust the left bunk as instructed, and will send a new picture soon. The lake has been OVER the dock three times since installation! I left the boat on the lift this winter, and so far it has weathered very well. I trust that Bo and everyone at Viking are doing well! I just wanted to drop you a note and let you know that I am truly happy in that I have the cleanest boat on the lake! The Viking Boat lift, now over a year old, is still working and looking great. The ability to effortlessly raise my new boat in and out of the water is awesome. It is so very different from the traditional lifts and very sleek. And it hasn't moved an inch....even through the winter ice. Thanks again for building and installing the best boat lift on the market! Hi Angelina ï¿½ thanks for reaching out to me and for checking in on our boat lift. Our Viking boat lift has performed perfectly since it was installed. I have not had one problem and it has not shifted one inch even with it being left in the water through winter ice and snow. Our neighbors got a lift a Viking Boat Lift about 2 years ago after having seen our lift (Doug and Deb) and I continually talk about the lift whenever we have visitors to our cottage. One of these days I need to add the electric motor to the lift so I can keep up with my neighbors. I highly recommend Viking boat lifts to anyone who will listen and many of my cottage neighbors are very jealous. Overall the lift works fine. Have had a 4000 lb 24 ft triple pontoon with a 225 engine on it no problem. Lift is stable and hasn't budged despite the mucky bottom. Even had one incident of 40 mph winds. Nothing moved. And yes, way less intrusive than the typical 4 post cable lift. even with the ice all around it. Really pleased with the purchase. Well it has been a very busy summer for us. The weather has been incredible, so having the boat lift has given us the pleasure of even more boating. I must admit, winding it up and down is definitely a chore, but well worth the effort. I have a boat that is clean as a whistle on the bottom. We have the kids (all 6 of them) help with the up and down. I am including some photos - to show you that having an unobstructed view of the river is very important to us. We can watch the ships going up and down and the sunsets without having to look around a big ugly boat lift. Thanks to Bo for a good job done! In October of 2004 we had Bo from Viking Boat Lift come and install one of their lifts at our dock. It was one of the best purchases we made for our boat. Not only does it look fantastic down at the dock, but even after six years our boat still fits like new. Living in Huntsville, Ontario we were greatly concerned about what we would need to do in the winter months as our lake freezes over. Bo assured us that this would not be an issue. The lift is permanent so there is no extra work during the different seasons and even with the ice there has been no movement of the lift. The mechanics of the lift also work just as good the day they were installed. Even as we are completely satisfied with the sturdy craftsmanship of the lift itself, we are even more impressed and satisfied with the superior customer service that we receive from Bo and Angelina. Our questions and concerns have all been directly answered and addressed in a pleasant manner. Bo continues to follow-up with us on a regular basis to verify that no issues have arisen. He even stops in when in the area just to see for himself that everything is running to his first-class standards. In all we are very, very pleased with both the service and the product of Viking Boat Lift and would highly recommend their business to anyone and everyone. Everything is good with us and I hope with you as well. We are very pleased with the lift and it works like a charm. I must admit that it met and even exceeded my expectations. Quite impressive. Also the installation went fairly smoothly and Bo is quite the character. All and all it was a good investment and I do appreciate you going out of your way to make this a pleasant experience. Thank you very much for the great service on the long weekend. It is nice to know that there still are providers out there with quality installations and service still available. I have just completed Year II of my Viking Boat LIft Experiment with great success and hope to continue for many more. My lift is in about 4 feet of water on a sandy bottom 140 feet from shore on Lake Simcoe in a big bay. We remove the dock each fall as the ice and storms have been know to rip apart anything left in their wake. So far Bo's lift design has withstood 2 winters, (more importantly 2 springs and ice melts) without a hitch. We raise the bunks up all the way and put a snow fence around the lift, so that the snow mobiles and ice fishing vehicles don't crash into it. It is a great design with the lowest draft, which we need for our shallow water. Our Malibu looks great sitting on the lift. I met Bo and he seems to be a very hard working, honest guy, who designed, built and installed the lift. Angelina is great too. This boat lift is great! Permanent installation required no season removal, and minimal maintenance. First day after ice melt in the spring, my boat is on the lift and ready for the season. I recommend this boat lift for people that need high quality and (a) 'heavy weather conditions' proof product. We remain very happy with the lift. It works and looks great, and I found it very easy to get used to, from pulling the boat in, to cranking it up, to locking it. The lift has performed well. Overall I am very pleased. It is very well built and handles the ice well. This lift has satisfied my major concerns: well built and rugged. Leave in the water in winter. Able to move it if necessary and a clean wave free boat. Well, after a slow start to spring I'm happy to say that I couldn't be more pleased with the boat lift! Even better than the ease of use however were all the the people who this spring had to admit they were wrong when they doubted the lift would survive staying in all winter! Not only did it stay in, it didn't move an inch! I am VERY pleased and would highly recommend the Viking Boat Lift. Time has really been rushing by. We are well and continue to enjoy our place here on the Tennessee River. Your lift continues to work just like it did the day it was installed. After 5 years all we have done is grease the fittings and replace the bunk board carpets. It is one well built piece of machinery. Thanks so much for building such a reliable product. Always available for a demo if you need one in this area. It has consistently gone up and down with a boat (on it) and without a problem. I would hazard to guess that it is probably the finest boat lift ever made. We have used the Viking Lift for going on ten years now and other then doing basic maintenance we have had no problems with it. Bo did a terrific job! This photo shows a Donzi, we've had our 21' wake boat on it and several others as well. Elegant engineering-simple design, with few moving parts, flawless operation for 5 years! Safe and secure lift. Ease of operation- with a push of a button the boat is in the water, no ropes, lock down mechanism required- just lower and go! Very secure system...worth every penny. I purchased a Viking Boat Lift in 1996....works great, and now my neighbours have purchased as well.....they all work excellent. Thanks to Bo and Angela @ Viking Marine International on an Excellent Product with excellent service. I purchased a Viking lift for my Ski Boat after meeting Bo @ the Cottage Life Show. The lift was custom Manufactured by Bo including a Custom Step Platform jointly designed by Bo and Myself. He and his crew made the journey to our lake, where it was professionally installed and has endured 5 seasons without incident! Many people stop and ask who makes this lift and how it lasts through the heavy ice in the spring. I highly recommend the Viking Lift for all Boats! It is virtually Maintenance free and the best part is you never move it! We've had our Viking for 2 years now, and 2 winters, and its in the exact same spot where Bo first put it. 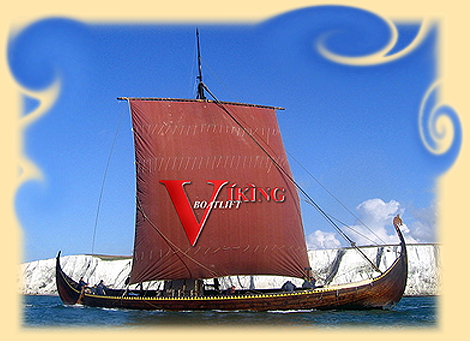 We're absolutely thrilled with our decision to get a Viking. Its not just clean-looking, its also incredibly solid. At the end of the season you just leave it. Every other boatlift is more work. Every other boatlift is uglier. Its a simple decision, call Bo'. Long time no talk. I guess we are still hibernating. Hope all is well with you. Thank you for taking time to look for asking about the Viking Boat Lift. I guess you are quite confident about your lift to go and prompt for feedback. I had so far no problem with the Viking Boat Lift. I just love it. So nice to be able to leave home and not worry about finding your boat banging on the dock, or worst, in the middle of the lake or banging on the rocks. We will probably put the bigger boat in the water next summer. It will be a toss between the Sea-Doo and the bigger boat as to which one will sit securely on the boat lift. Perhaps on the long run, we may have to buy a second lift. The ice last year has not moved the lift by an inch. This year, it will be another test. I have confidence however that it will not move. I have so much confidence that I have attached my dock to the boat lift. My dock is too heavy to be removed from the water. Normally, I tie it up along the shore, but this year, I decided to leave it in place (with removal of the bars holding each sections) and leave it in place tied-up to the boat lift. A new experienceï¿½. All that to say that whoever wants to hear it, this is one of the best purchases I made. It was about one year ago when the door bell rang and Bo was here at last. I had been waiting for some time but I knew that this lift would be worth the wait. I was not disappointed. This lift is the talk of our neighborhood here on Lake Murray in South Carolina. This lift is really a heavy duty, well constructed unit that is easy to use. The outside walkway is a must if you plan to cover your boat. My bass boat weighs about 3000 lbs. and cranks up with little effort. We get high wave action at my location and believe me, the lift has not moved from the position Bo placed it. Angelina is great to work with and will always tell you straight-up whats going on with your lift order. It has been almost 10 months since Bo came to install our boat lift. First, I have to say that I was somewhat skeptical about leaving the boat lift in the lake all winter knowing how rough the ice can be in the Spring. I am glad to say that the boat lift has not moved an inch and since then, we have purchased a Sea-Doo and using the lift for it. It is unbelievably stable and such easy to use. It brings a lot of questions from friends visiting and neighbors. I do not think that one person have not said something about the original and neat look of the boat lift compared to the other types available on the market. All that to say that the little family is extremely satisfied with the Viking boat lift and finally found a way to fully enjoy our waterfront with leaving our boat secured in the lake and not having to worry about having the bottom of the boat all dirty. We really liked Bo and felt he was very knowledgeable and professional. Sharon was impressed and now understands why I trusted you guys with my money and patience. The picture on the website looks fantastic. My boat hoisted up beside the Canadian flag paints a perfect picture. Bo and Gary never quit the job until they got the lift just right. Now we can jump in the boat, drive away in seconds at the push of a button. When we leave our cottage we are comfortable knowing our boat is safe and secure. Thanks on a great job. I will recommend your lift to everyone!! The picture looks " Tremendous " on your web site. The very best of good luck to Viking Boat Lift & its staff. You guys are the very best in the business!!! I really love this lift, it is a great way to keep the boat out of the water and still get it back in 60 seconds. I use this lift every single day June to September and it is working very well for me. Lift is performing very well and more importantly we are able to enjoy our boat more. We no longer worry about the boat hitting the dock with bad weather or heavy boat traffic. Love the way the boat looks on the lift. The installation went well. Its a great boat lift. Well engineered and it has a sleek modern look. It is well worth the wait. I am certain that it will lift the boat high enough to keep it above the water when the level of the lake rises. It will make it possible to use my boat year round, and lift it up during bad weather. Things are going great. The lift is working out fine. This will be the 4th Michigan winter for the lift and it still looks like its new. I get all kinds of compliments on how good it looks. Just wanted to let you know how well the Viking Lift is working out for us here in Florida. It works flawlessly and is the envy of my neighbors. It's exactly what I wanted, a 6000 lb. capacity lift that operates well on 115 v. As an added bonus, when the property appraiser came around, unlike my neighbors who were taxed on their lifts as real property, I was not as mine is not attached to the seawall and is considered portable. We are extremely proud of our Viking boat lift, not only because of the appearance but also the performance of the lift. We normally have to clean the hull and bottom for two days after being in the water all summer. The boat lift keeps our boat looking great all the time. Entering and exiting the lift is a breeze. We are always showing the lift to other people. Hopefully they donï¿½t think we are boasting. Most people donï¿½t realize that we have a lift until they get to our dock. It is the best investment we could of made with our boat. Always good to hear from you and Bo. The lift is working great! It has performed without any problems since deliver. It is so nice to have a piece of marine equipment you do not have to second guess. "I don't know about you, but after reading a bunch of these, I am amazed that EVERY boat owner isn't clammering for one of these lifts. I know these are actual client comments because some come directly to me via email, to be added to the site. This has GOT to be one fine product." The lift works great have had it for six months now and have had no problems. has handled winds up to about 30 mph and has not moved. love the remote feature. It (the Viking Boat Lift) has worked as advertised. I will attach a copy of a photo with the boat. If we can serve as a reference for western Montana we would be happy to. When we look out from the house and see our boat high and dry from the wave action we are reminded just how well your Viking lifts work and how well they hold up under all conditions. Your installation of our lift was positioned just as we had planned and to this day the lift has not moved. Thanks again for building a product that works so well and almost disappears when in use. We really like it. exactly where I wanted it. The remote control is a great feature I use it all the time. I want you to know that I am extremely happy with the lift, and am impressed with the rugged construction. Again thanks for a great product and a job well done. We are located on the North Shore of Upper Rideau Lake. Boat's here have sunk on this shoreline which were fastened with whips. We copied our next door neighbour who has had his Viking Boat Lift since 1999....... It hasn't moved an inch with the ice break-ups. We have complete trust with ours, and it is a joy winding down so easily to float, and then raising it up to it's absolute secure and high levels. Bo and his helper are great guys who know exactly what they are doing, and enjoy it!! Believe it or not, it is almost a year since the lift was put in at our cottage on Pigeon Lake. It worked great all year and docking into the cradle was never an issue. The option of putting the cover on after it is docked is great also. I was up last weekend and the lift, as you said, did not move. It is very comforting knowing that the boat was safe and sound when we were not there. We did have a number of people stop to see how the boat was supported, hopefully you get a few calls. I did my research and came up with your product via the Internet. I was right! Your product and service were/are #1. We just love our boat-lift and how it operates so easily and looks absolutely great with our boat perched on top! The Viking boat lift tripled our family's boating pleasure on Lake Ontario this past summer. Instead of travelling to the marina and back, we just hit the remote to lower the boat down, turned the key, and we were out on the lake within minutes! Also,the guides made it simple to drive right back up on the crib when you're done. Couldn't be easier! We would recommend Viking's smartly engineered and quality built boat lift to anyone who wants to get the most use of their boat. I am glad I had a Viking Boat Lift versus others......... August Friday the 13th. Hurricane Charley roaled past at 145 mph. (173 mph unconfirmed). Some lift's collapsed but this one stayed in place and kept my boat safe......thankyou. Bo's Note: Joe's boat was on the lift during the storm. Everyone here is fine. The lift performs beautifully. It weathered the hurricane winds with the boat on it without a problem. We feel this lift was one of the best investments we have ever made. So easy to operate, sturdy, even a child could pull the boat in. Please tell Bo the family says hello and wishes him well. I looked at a number of lifts before going with the Viking. The Viking design is simply the most rugged and aesthetically pleasing lift available. Our lift has been in the lake for 3 years, ice and all, and has never let us down. You cannot go wrong with the Viking (boat) lift. The entire process, from ordering to installation to operation went very well...No surprises. Your product is unique and works great. I have recommended your company to other waterfront/boat owners in my area. Y'know, to be completely fair, we should show some of the 'negative' comments on our boat lift. "What? It doesn't come in RED?" My wife says the Viking Boat Lift was just installed. "I can't see it!" "Where'd he put it?" All my neighbours came over to see it and said: "That's it?" "Where's all the wheels and slings?" They think I got ripped off. "What? It doesn't come in PINK?" My wife had a Viking Boat Lift installed and it works so easy that I no-longer have any more reasons to NOT go out there. I don't have the heart to tell her....I hate boating. Don't buy one! You'll be asked about who makes it, at least once a day. Its been a whole summer since I received my Viking Boat Lift and my neighbour still bugs me about when am I getting it. I keep telling him that "It's--just--right--there! ", but he can't see it. What? I can't get it in Baltimore Colts colours? Following up from my boat lift installation over a year ago, I just wanted to mention how impressed I am that everything continues to work as promised (or better). I wanted a lift that was going to be easy to use and also stand up to the ice, since I wasn't able to take it out for the winter. After the first winter, the lift is still sitting in the water exactly as Bo installed it-- without any sign of wear or aging and without the need for any adjustment. Of course, we get a little bit of exercise cranking the boat (an 18 foot Bayliner) out of the water, but my wife or kids have no trouble doing it on their own. We tend to park the boat along side our floating dock during the day, but always put it on the lift in the evening or in any kind of rough weather. My cottage neighbor finally got a boat and we recommended he consider a Viking Boat Lift also. We love the boat lift. It is so easy to use, very accessible, and has dramatically improved our attitude! The installation was smooth and easy, even with our challenging terrain - we just can't say enough good things. Many boats have done a double take to check it out - I expect you will have many referrals. Thanks for all your help, and feel free to refer people to us for references. I wanted to drop you a note and tell you how please I am with my Viking lift. As you know I purchased a brand new 20-foot inboard ski boat at the Toronto Boat Show 2003. I decided that I did not want to tie my boat up to my dock so I started researching boatlifts. At the time I was only familiar with the standard four post cable units that are from my opinion an eyesore, not to mention the fact that you must remove it from the lake every fall and reinstall it in the spring. So I took to the web to search out alternatives and found your web site. After my first meeting with the two of you I was convinced that you offered the best product and tremendous customer service! It has been a year since you installed my lift and I am happy to say the unit has work flawlessly and it survived a very difficult Muskoka winter without any issue. Bo did a fantastic job installing the lift, during a miserable cold and rainy day. He willingly returned to make some minor adjustments. You have also been very responsive to my questions via phone and email. I just wanted to share with you my satisfaction now that I have enjoyed using the lift for a year and say thanks for building such a great product and providing excellent service! The Viking Boat Lift has turned out to be exactly the boat lift we were looking for. We had several concerns in our location: salt water, a very muddy bottom, tidal water which can get fairly shallow and a narrow canal which didn't allow us to use pilings. We also wanted a unit that was easy to use and dependable. The lift accommodates all of these concerns. After seeing the thickness of the metal used on the lift, I'm sure it's lifespan will outlast our boat. The lift sits solidly despite a muddy bottom and we are able to get our boat off even at low tide. The lift is easy to use and the mechanism is so ingeniously simple I expect it to be trouble free for years to come. In addition to all of this, it has been a pleasure to deal with Bo and Angela. We looked for a lift for quite some time and are very happy with our final decision. Just a short note to say THANK YOU for such a "1"derful product that you guys produce. Once again, after a long cold winter, we just put our boat back in the water and as always, your boat lift worked perfectly. Our boat is now setting all save (*safe*) and sound out of the water. The quality of your product is exemplified by the "3" other Viking Boat Lifts in our neighborhood and the inquires we receive from others. I also would like to THANK you for the expert installation of your product. Your boat lift is the center piece of our dock. Thanks again from another happy customer. We just wanted you to know how much we appreciate using our Viking Boat Lift. After three summers, it still looks and works like new. However, the best part is that, we do not have to take it out of the water for the winter and then put it back in the spring. We have a lot of ice in Sandusky Bay, and the lift has survived with no damage. The facts are simple.... I love the lift !!! I showed it to a lakefront neighbor today when we were taking the kids snowmobiling. The first year was great, and can't wait to put my trophy on the lift in the spring. Because I did not take any pictures of my boat during the summer season, I thought I would write to you next season. As I was down at the lake today, it dawned on me, you may be able to use this information -- it is one of the reasons I purchased your lift. If you remember our lake level could vary drastically during the summer season. In fact, two seasons ago, the water level was too low, and I had to leave my boat sitting in the water for a month before the water rose again... drove me nuts. To my point, the two pictures attached, I took today. My one daughter is holding a tape measure. I sprayed a red stripe on the lift to indicate when the water depth is getting to low in the lake for me to leave my boat on the lift. The top of the red strip is 25 inches off the lake bottom. That is the point that I need to be careful. The draft on my Sea Ray is 19inches. When the water is 23-25 inches, I still have no problem having my boat float on and off the lift. Where else can you get a lift with such low water needs. I love this lift. I will send you more and more pictures when my boat is sitting 4 feet above my docks. It is my trophy ! "When I first started looking for a boat lift back in January of 2000, I wanted a lift due to the fact that my boat was so heavy I could not really tow it and the fact that I lived on a busy slew, had a lot of boat traffic and wanted to lift the boat out of the water due to the fact that the (river) leaves dirty "coffee stain" on the hull and the only way to remove it is to scrub, scrub, scrub. I did not have power at my dock so I searched the internet for boat lifts, I looked at solar power lifts, cantilever lifts, pneumatic lifts and finally a manual lift from Viking Marine. I found your internet site and after talking with you several times I made the decision to purchase you[r] manual lift for my 25 ft Sea Ray, which weighs about 5,200 lbs (with fuel) vs. buying one that required me running power to the dock. I had some concerns about the weight of the boat and the manual lift but the large hand wheel you supplied to raise and lower the lift made it seem effortless (even to my 13 year old son who lifted the boat several times - even Mom helped - sometimes)." "obviously my neighbours must have liked it too because three other lifts (all from Viking Marine) went up in our slew within a few months." "Since I have installed the electric motor at my new home (YEA :-) I have power at the dock) I love the lift even better, especially the remote. I also have enjoyed all the attention the lift gets, people come by the dock 'just to look' and I even had one person ask what was lifting my boat." "I have enjoyed working with you and Bo and hope to see ya'll again soon, installing lifts for my new neighbours. Thanks for everything, Eric B." "Hi! Bo. I've got to tell you the lift has been wonderful for us up here on Lake Nipissing. For the last five years we've had no trouble. And being the fisherman I am its used on average twice a week, from ice out to ice on. Speaking of ice, we've had ice shifts at thaugh [thaw] and it never moved a thing. MUST HAVE BEEN YOUR PROFESSIONAL INSTALLATION. THANK YOU MUCH FOR YOUR WONDERFUL SERVICE. Hi Bo - just wanted to let you know that the lift you installed at my cottage on Lake Huron is still working great! After 3 winters of the lift being frozen in solid ice and a number of wicked storms - the lift still looks and works as well as the day you installed. It definitely is passing the 'test of time'. Keep up the good work and thanks for a great lift! ~ And it works like a charm (smooth, reliable, easy). When I decided to buy a beautiful restored wooden boat, I knew I wanted a boat lift. But all the lifts advertised in the Boat mags and on the web were all wrong. The 4-legged versions were too expensive, ugly, had to be removed in the Winter and could only work in shallow water. In short, a lot of money for NOT a lot of lift. I wanted a lift I could put at the end of my dock, where it was almost 15 feet deep. The only versions that could seem to do this (I thought!) were pontoon contraptions that I really did not like (very unattractive and looked very tricky). What to do..
Then, by luck, I stumbled across your website, and it seemed to be too good to be true. A lift that could go in almost any depth, was nearly invisible when in use, and did not have to be removed in Winter. Working with you was a dream - you are great. Friendly, cooperative, and willing to explain everything. And the ultimate - Bo would do the installation - all the other so-called fancy lift companies wanted me to both arrange for the installation and the seasonal removals and re-installations. Argh. Bo and his crew installed the whole extraordinary thing in a couple of hours and I was in business. AND - the Viking Lift was the most reasonably priced unit on the market. Twice the lift for nearly half the price. There is a kind of art in great design - your lift is on the list of great yet simple designs. And it's backed by a great team. You and Bo have shown an interest in me as a customer after the sale and that kind of follow-up is rare these days. A resounding "It's the best lift in the biz" from Josh. So, best of luck and have a great Summer. I just wanted to send you a follow-up note on the boat lift you installed two years ago. I can sum-it-up in one word, "awesome". Your dual lift system with remote control, lifts my 30', 10K lbs., cruiser with ease. As you may recall, the canal water was shallow and the bottom very soft, but your lift remains in the exact same installed location. I also thought that our cold winter ice would move the lift. No way. . .this lift supports my boat all winter and remains as steady as a rock. Your boat lift is truly an excellent product, and your installation and follow-up was superb. Several of my neighbors are interested in your boat lifts and should be calling you soon. I thought I would send you an e-mail to let you know that I am very pleased with the boatlift Bo installed for me. I always had a great deal of concerns with my boat sitting in the water between our cottage visits. The new lift has provided me with relief and a great deal of peace of mind from many concerns such as sinking, drifting away, banging against the dock and reduced risk of theft. The unit has had no impact on the way we use our waterfront which is a bonus. It fit very neatly between our two slips and I thank Bo for his ingenuity working around the cribs. I am looking forward to many years of use and peace of mind. Dear Sir: I am writing to express my great satisfaction with your boat lift. I shopped long and hard before making a decision, and I am convinced that I made a great purchase. This is the most unobtrusive lift available. I did not want an "apparatus" ruining my waterfront. It seems as if my boat floats in air rather than sits hanging in a metal sling. When the boat is gone, the stem of the lift seems like it belongs to the dock even though it is not attached. Launching and docking are an absolute breeze with this lift. I recommend your company to all who inquire about the lift. The technology, strength, esthetics and delivery and installation were superior. Just a short note to provide feedback about my level of satisfaction with my Viking Boat Lift. Four years ago we noticed the Viking Boat Lift on display and was provided with a great "touch-and-feel" demo of the product. We did not own a boat that would compliment the lift, but kept it in mind. Since then, we have acquired a nice boat that we wanted to keep "on the ready" for weekends of fun. The Viking product was our point of reference and standard for comparison as we shopped around. Through our search, we became more and more convinced that the price and installation service provided by Bo at Viking was making sense. The attractiveness of the non-obtrusive Viking lift, and the ability to leave it in the lake over the winter were most favourable. We even convinced Bo to paint the lift hunter green colour to match our cottage and boat trim. (didn't know that Bo had it in him to respond so favourably to the female touch). I am delighted to know that my boat is safe and secure, and ready to go when I get to the cottage. It has been a most favourable experience, right down to the installation and customary photo shoot upon completion. Excerpt from a letter sent by Ruth and Geoff..... "Just wanted to let you know that the Viking lift worked great during hurricanes Dennis and Floyd.We had some soundside flooding so I had cranked the boat up about six feet above normal water level. Water came to within a foot of the bottom of the boat. I also felt that the boat was absolutely safe in winds up to 80 mph with no movement at all. I wish other boat owners could have seen this boat sitting high above the flood waters." Fred saw us at the Cottage Life Show in March '99 - so did Jim, and Michael, and Peter, and Diane, and Doug, and John, and Elgin and Cindy. They all enjoy their own Viking Boat Lifts this year. Actually, John liked it so much that he purchased three - all electric - two for inside his boathouse, and one for outside. Peggy said that if they were going to purchase a boat lift it would be preferable to have one that would not interfere with the beautiful view outside their window. So Hazel went shopping with that thought in mind. He found us at the Cottage Life Show '98, and now Peggy and Hazel enjoy their own Viking Boat Lift - and the view. John was one of the first people to purchase. He ordered the Viking Boat Lift with a custom swim deck ( you saw the picture ). He ordered another standard Viking Boat Lift the following year. He and his family get a lot of use out of their lifts. He has actually been kind enough to show interested people his lifts. He showed Bob and now Bob enjoys his own Viking Boat Lift. Peter sent us a nice letter. He " shopped long and hard before making a decision ", and Peter said that " launching and docking are an absolute breeze ". Peter and Diane appreciate that the Viking Boat Lift is " the most unobtrusive lift available ". Mike, after over two years, still comes by to visit us once in a while. He has a neighbour who would like us to come by to see his site. Another future home for the Viking Boat Lift? We will let you know as soon as we find out. (Aug '99) We went to see Mike's neighbour - and guess what? Turns out Mike had two neighbours who were interested in the Viking Boat Lift. Chris and Larry both chose the Viking Boat Lift.